Do you have the skills necessary to become a MAPP Certified Coach? 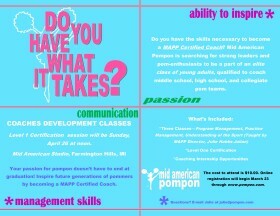 Mid American Pompon is searching for strong leaders and pom-enthusiasts to be a part of an elite class of young adults, qualified to coach middle school, high school, and collegiate pom teams. Register online for the Coaches Level 1 certification class. Those interested should contact Julie with additional questions.